A large amount of polyglutamine repeats gives rise to the neurodegenerative disease that is known as Huntington's disease. Among years, scientists have tried to find a mechanism that can stop the development of being sick but it still being discussed. Here, we review recent data from two experiments associated with the use of CRISPR/Cas9 whose objective is to find the most effective solution for the treatment of this disease. One of them consists of the reduction of expression of the mutant gene while the other seeks the permanent inactivation of this same gene. Una gran cantidad de repeticiones de poliglutamina da lugar a la enfermedad neurodegenerativa que se conoce como enfermedad de Huntington. Durante años, hemos tratado de encontrar un mecanismo que pueda detener el desarrollo de la enfermedad, pero continúa en discusión. Aquí, revisamos datos recientes de dos experimentos asociados con el uso de CRISPR/Cas9 cuyo objetivo es encontrar la solución más efectiva para el tratamiento de esta enfermedad, una consiste en la reducción de la expresión del gen mutante, mientras que la otra busca la inactivación permanente de este mismo gen.
Palabras clave: CRISPR/Cas9, Enfermedad de Huntington, Huntingtin, PAM, Gen mutante, Neurodegerativo. Huntington’s Disease (HD) is a neurodegenerative disease which is progressive and produced by 36 or more repetitions of a specific triplet which is CAG. These repetitions are capable to encode a polyglutamate sequence. This abnormal sequence is produced by the alteration of huntingtin gene (HTT) which is found on the chromosome 4. HD is easily transmitted from sick parents to children, it means that is an autosomal dominant condition. For the following reason, this condition has 50% of probability to transmit the abnormal gene 1. The symptoms of HD are manifested in the patients depending on their age because most cases, the appearance of symptoms begin between 30 and 50 years old 2. At the same time, HD can be divided into three parts depending on their symptoms. There are three phases: early, middle and late. In the early stage, patients present involuntary movements, coordination problems, difficulty to think and depression in low quantities but these symptoms cannot affect completely their daily activities so, they maintain their autonomy. In the middle stage, their coordination and their capacity to think are seriously affected, so, they need help to realize normal activities. In the late stage, patients are confined to bed, need assistance and have difficulties to communicate 1. Nowadays, using the CRISPR/Cas9 technique, scientist have achieved alleviate motor deficits and, in another case, they could inactivate permanently the mutant gene that causes HD. The Clustered Regularly Interspaced Short Palindromic Repeats (CRISPR) and the endonuclease protein Cas, constitute a mechanism that acts like immune system in prokaryotes, generating a resistance against foreign DNA. This technique is used to edit genomes through insertion, change or deletion of genes using Cas9 that acts like molecular scissors that cut a specific sequence 3. CRISPR/Cas9 system works with following components: sgRNA with a guide sequence, Cas9 protein and Protospacer Adjacent Motif (PAM). Scientists create a guide RNA that join with Cas9. Then, PAM triplet which is adjacent to the target site, help to ubicate the Cas9 and bind the guide sequence with the corresponding target sequence. This linkage represents the part of the genome that Cas9 is going to cut. For this, is important to consider that for each organism is needed a specific PAM triplet and a Cas9 protein according to the function that the system must achieve 4. Huntington’s disease is a dominant disorder because the mutant protein (Huntingtin) which is the factor that provokes the disease. For this reason, current investigations using CRISPR/Cas9 have the objective to avoid the expression of the mutant. 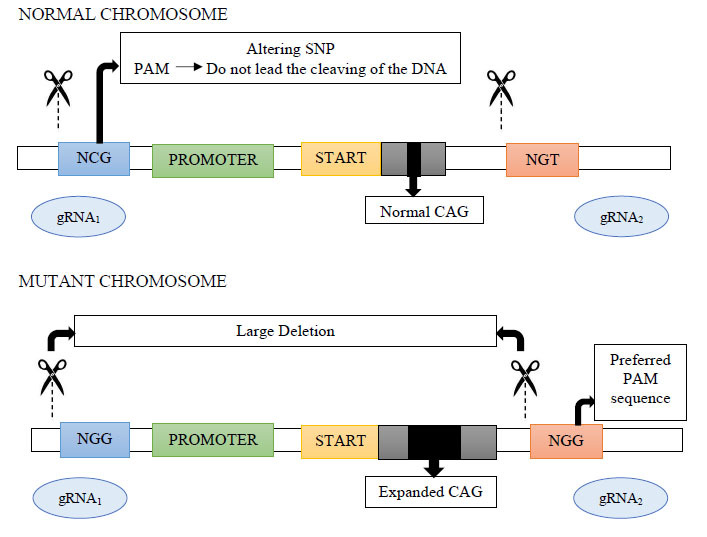 The present work contains a review of two cases in which the CRISPR/Cas9 technique is used to produce a reduction and permanent inactivation of mutant gene expression 5,6. Using CRISPR/Cas9 technique to avoid the mutant gene expression, is important to suppress only the mutant part of the Huntingtin gene (HTT). Is demonstrated thought experiments in mice that the complete absence of HTT provokes embryonic death. Additionally, these experiments assure that the reduction of the expression of the mutant Huntingtin gene (mHTT) in neuronal cells of mice, could achieve to lessen coordination problems as those described before 5. Using CRISPR/Cas9 efficiently reduce the expression of the mutant Huntingtin gene and can be used for therapeutic approaches but require continuous administration. The neurological symptoms of this disease can be related to vulnerability and selectivity of a specific neurological population. This inhibition of the mutant protein manifestation is a new alternative that can change completely the treatment of this disease that is the result of a lethal gain of function of mutant genes. Another experiment that uses CRISPR/Cas9 to obtain a permanent inactivation of mHTT without affecting non-mutant allele. This experiment avoids the expression of mutant Huntingtin protein in cell cultures (Figure 1). This shows that this mechanism can be effective to inactivate HD mutation in animals and humans. Is important to consider that this strategy guarantees that the non-mutant allele is not affected in the process 6. Figure 1. Permanent inactivation of mutant gene expression is mediated by NGG (Preferred protospacer adjacent motif sequence). In a mutant chromone is possible NCG and NGT do not allow cleavage. PAM generates CRISPR allele specificity. As a consequence, a large deletion in the mutant chromosome. Different haplotypes (variations) of the mHTT were tested to find the single-nucleotide polymorphisms (SNPs) that modify the PAM sequence. So, they were achieved to choose the PAM sequence specific for CRISPR/Cas9. Then, they design two sgRNAs that have the function to recognized and bind to the mutant sequence. CRISPR/Cas9 is responsible to cut the binding sequences between sgRNA and mutant permitting avoid the expression of Huntingtin protein in primary fibroblast cells 6. Investigators found that applying CRISPR/Cas9 in HD can inactivate the mHTT permanently in the culture of fibroblast cells. To achieve this conclusion in the investigation and have better results, the remove of mHTT with this technique must be carried out before the appearance of symptoms. For this, the use of CRISPR/Cas9 is recommended to use in another late-onset neurodegenerative disease like Alzheimer’s and Parkinson’s. Before using this technique in human, the effectiveness of all its components and the degree of the benefit to the patient must be guaranteed 6. New alternatives that can help in the treatment of this disease have appeared through the years. The development of these new techniques like CRISPR/Cas9 is essential for the investigation of this extremely difficult diseases especially because they are related to the brain. The models described differ in their results. Besides, we can see that the permanent inactivation of the expression of the mutant gene provides the guarantee that the non-mutant allele is not affected. 4. S. Rodrıguez, N.S. Vispo, J.E. Simon, CRISPR-Cas9 : A Precise Approach to Genome Engineering, (2018) 1–7. doi:10.1177/2168479018762798. 6. Shin J, Kim K, Chao M, Atwal R, Gillis T, MacDonald M et al. Permanent inactivation of Huntington's disease mutation by personalized allele-specific CRISPR/Cas9. Oxford academic. 2017.